The Main North: 30 MPH Max Speed "Matching" of ALL my Locos. On my trip to U.S. in July 2011, where I saw about 20 "high tech" mostly DCC layouts and many home and exhibition layouts here in Sydney, I’ve observed that all trains barring a few, are run at speeds below 30 MPH. I wonder how many model railroaders operate their locos at their maximum prototype speeds. 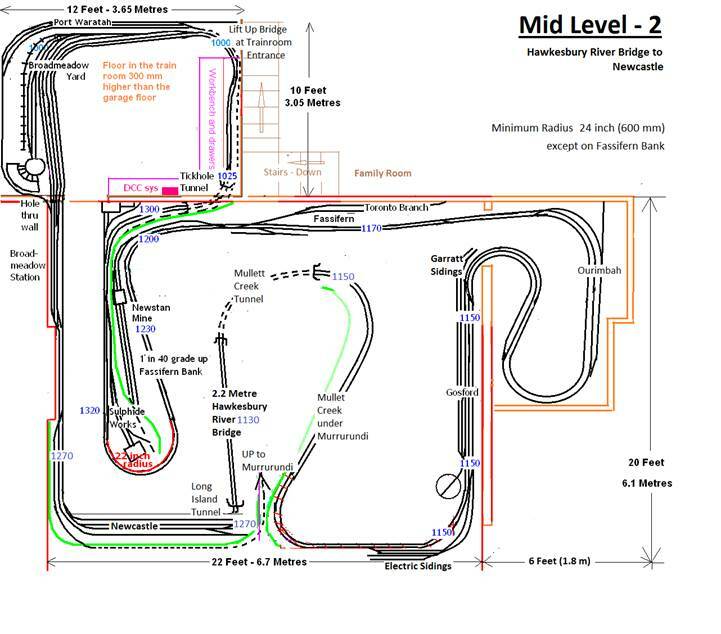 My double deck “Main North” is located in a 30’ X 30’ area (approx). There are no long straight runs and many of the curves are 24 inch radius. This means operating at near prototype maximum speeds is impossible. Some trains require require double heading of locos. Most steam hauled trains need to be rear end "banked" up the 60 foot climb to Ardglen where a second Operator couples up the Banker engine to rear of the train then both Operators "drive" their loco at approximately 10 MPH, up to Ardglen. "Speed Matching" my locos as below, will help my Operators keep the locos/trains on the track and off the cement floor 5 feet (1500mm) below. 1. What I consider a better "finer" control of your locos. Full range of your locos (0 to 100%) is now 0 to 30 instead of 0 to 70 etc, where in most cases you only used "half" the range of the Throttle. 2. ALL locos, speed wise, operate the same making Banking or Double Heading, easier. 3. Adjusting your Speed Table or CVs 2, 5 and 6 to provide a LINEAR response, the display on my Procab now indicates the approximate Miles per Hour. That is at Speed Step 20 the loco is travelling at approximately 20 MPH as shown etc. Using a Speedo Car, makes Speed Matching your locos easy, see my Speedo Car Blog entry. As with all my programming, I use Programming On the Main - POM. This method gives you instant results "out on the track, eliminating the necessity of returning to the Program Track, that's necessary when Speed Matching locos. NOTE: Contrary to what you may heard/read, using POM correctly, no OTHER loco will be programmed. Just follow your Throttle "prompts", reading them all and go slowly. Connect the Speedo Car to the loco and adjust the Top Speed to 30 MPH. Do this for all of your locos and they'll all be going at the same speed. For 36" length of track - 10 Scale MPH takes 18 seconds and 30 Scale MPH takes 6 seconds. Adjusting the decoder’s CV 5 will provide “close enough” speed matching. You may also need to adjust CV 6 to "half of" CV 5's value, to make the speed curve "linear". When reducing CV 5 and 6, the loco's "take off" may be affected so CV 2 may need re-adjusting to get a smooth jerk free take off. 1. Selecting a Speed Table in CV 25 and programming CV 66 (Forward) and CV 95 (Reverse), to less than 128 – lower the value, the slower the speed. See Tsunami Manual. 2. Selecting the “User Defined Speed Table” (CV 25 to 16) and making a Speed Table. For all of my programming, I use Decoder Pro, downloaded free from the Internet and loaded into my Laptop that's connected to my NCE DCC system. See the link at the bottom of this page for details. Make a Decoder Definition if you don't already have one, for your desired loco. TICK the "Use Speed Table". 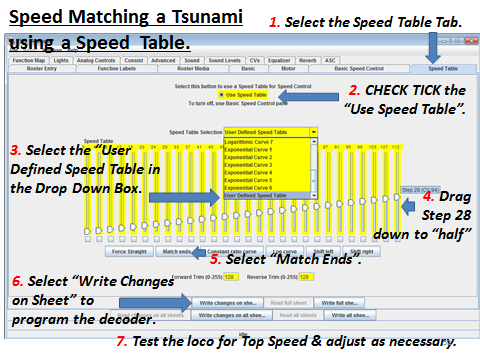 In the "Speed Table Selection" select "User Defined Speed Table". Place the cursor on the Slider for Speed Step 28 (CV 94) and drag down the Slider to about midway (120). Then select the "Match Ends" tab under the Table. This will adjust all the intermediate CVs to make a linear line "speed curve". Select the "Write Changes" Tab. Decoder Pro will program the appropriate CVs. Operate the loco at MAXIMUM Speed. For me this is Speed Step 28 when using 28 Speed Steps - NOT 28 out of 128. Repeat the above Steps 5 to 9 until the Speedo Car displays 30 MPH or your desired Top Speed. Without the Speedo Car, use the Stopwatch and Calculator from above. Note: For HO, the loco should take 6 seconds to travel the 36 inches for 30 MPHs etc. Tsunamis “out of the box” provide a too high slow speed and a noticeable jerk between the lower Speed Steps, when using 28 Speed Step Mode. Operation is better with 128 Speed Steps. My Tsunami adjustments are based on what Bruce at Litchfield Station posted some years ago and a long discussion on Back EMF on the Soundtraxx Yahoo group during June/July2010. Program both CV 3 and 4 (Momentum), to “0"
Progressively increase CV 210, starting with “1”, until the loco moves, at Speed Step 1, albeit a little jerky. Program CV 209 increasing by 5 until the loco is smooths out. Reducing CV 212 (default 255), will further slow down the loco. Using 28 Speed Step mode with the Maximum Speed reduced to a 30 MPH, the voltage increment between Speed Steps is about 1/3 of the default Linear Table, so the jerkiness between Speed Steps has been all but eliminated. Along with adjusting the Tsunami's CV 209 & CV 210 & zero momentum as above, Gerry Hopkins suggests to adjust CV 213 to 6 & CV 214 to 9 for perfect low speed control on ALL Tsunami 1 decoders. When finished with adjusting the Tsunami, adjust CV 3 and 4 (Momentum) to your desired values. great update, if only I understood what it all meant.